I had big plans for another cake in a jar this week and then Fine Cooking posted a beautiful Carrot Cake Roulade on their Facebook page. Easter seemed like a perfect time to try a new carrot cake and this recipe intrigued me with it’s fresh pineapple and fresh cracked black pepper. So, Carrot Cake Roulade was my contribution to the family Easter Dinner. I loved the cake and it went over very well with all the family. 93 year old Papa Pete had seconds! My only complaint about the cake is that it rolled into a bit of a messy display and the powdered sugar as a topping melted quickly into the moist cake and disappeared. Today I decided to try it a little differently. I baked the cake in two 8 inch round pans and made it into a layer cake. It was much easier to make presentable than the roulade. Hopefully it tastes as good–I left it in the refrigerator of a friend as a welcome home surprise. Second layer ready to flip onto first layer. The two layers ready to be frosted with Cream Cheese Icing. A light, sponge-like carrot cake with a refreshing pineapple and cream cheese icing. Delicious and perfect after a heavy meal when you just need a taste of sweet without a dense piece of cake. Finally chop 2 cups of pineapple and allow to drain. Combine the cream cheese and butter and mix on medium speed until well combined and creamy, 2 to 3 minutes. Add in the icing sugar gradually, beating and scraping until well combined. Position a rack in the bottom third of the oven and heat the oven to 350°F. Butter 2 8 inch round cake pans. Line the pans with parchment. Butter the parchment and dust with flour. Combine orange zest and 13 ounces of organic baby food carrot puree and set aside. In a small bowl, sift together ¾ cup flour, cinnamon, baking powder, baking soda, nutmeg, ginger, pepper, cloves and salt and stir to combine. Using the whisk attachment on an electric mixer beat the egg yolks, brown sugar, and granulated sugar on medium-low speed until combined. Increase the speed to medium high and beat until light and fluffy, 3 to 4 minutes. Add the carrot mixture and mix on low speed until just combined. Gradually add the flour mixture, mixing on low speed, until just combined. Transfer the mixture to a large bowl. In a clean bowl, with a clean whisk, beat the egg whites on medium-high speed until medium peaks form, about 2 minutes. Fold one-third of the beaten whites into the carrot mixture to lighten it. Gently fold in the remaining whites until the batter is evenly colored, with no streaks of white. Transfer 3 cups of batter to each prepared pan, gently spreading to even it out. Bake, until golden-brown, set to the touch, and beginning to pull away from the sides of the pan, about 12 minutes. Immediately loosen the cake from the sides of the pan. While the cake is still hot, lay a clean kitchen towel over it. Invert the cakes onto a cooling rack. Remove the baking sheet and parchment. 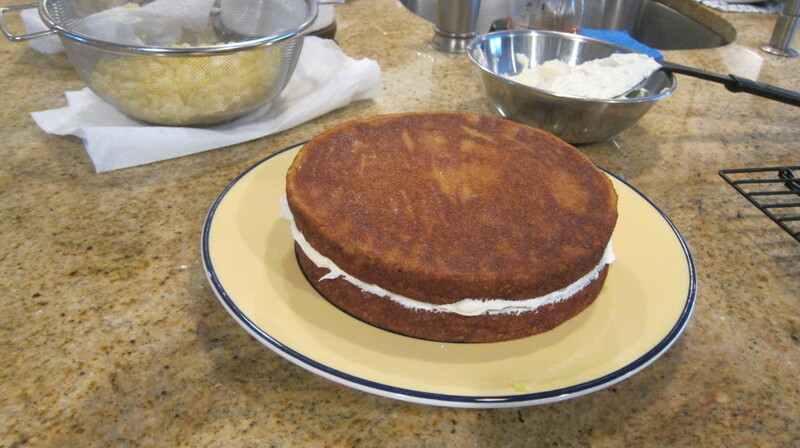 Transfer first cake to plate or stand and spread a thin layer of cream cheese filling on it. Sprinkle pineapple pieces over the filling. Lift the second cake layer and hold it in the palm of your hand. 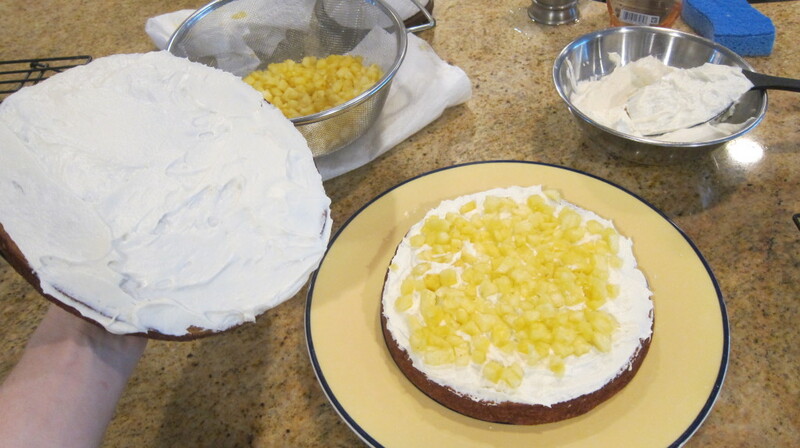 Spread a thin layer of filling onto it before inverting it onto the pineapple layer, filling side down. Spread remaining cream cheese over entire cake and sides. 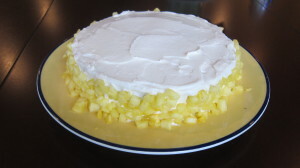 Press pineapple pieces along the sides of the cake. Grrr! I am only going to get to read about these cakes now! Lost my position as official taster! Looks delicious! I love carrot cake.